All good things must end..or at least be over until the Fall. Delayed Harvest Season in WNC ends in a few weeks (June 2) and we are sad to see it go. It seems pretty easy to say that this has been by far our best season yet. The number of fish landed during the dh season is always crazy, but the size of the fish this time has just been mind blowing. 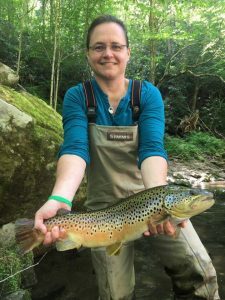 This season we had one client, who had never fly fished before, land 3 brown trout over 20 inches. During one trip. One 4 hour guide trip. 3 browns over 20″. You could fly fish your entire life and never land a brown like that. Much less 3..in one day. As we were releasing the third one back into the water, he asked me with a huge grin, “Is it always like this?”. I wanted to say “only in my dreams”…but I told him in WNC, anything is possible. You have a few more weeks to get out on the water and enjoy the delayed harvest. Come see us! There's no bad day to fish!